Background: A substantial body of studies supports the view that molecular and cellular features of endometriotic lesions differ from those of eutopic endometrium. Apart from that, evidence exists that the eutopic endometrium from patients with endometriosis differs from that of females without endometriosis. Objective: Aberrant expression profiles include a number of non-steroid signaling pathways that exert their putative influence on the pathogenesis of endometriosis at least in part via crosstalk(s) with estrogen-mediated mechanisms. A rational to focus research on non-steroid signal pathways is that they might be remunerative targets for the development and selection of novel therapeutics to treat endometriosis possibly without affecting estrogen levels. Results and Conclusion: In this article, we describe molecular and cellular features of endometriotic lesions and focus on the canonical WNT/β-signaling pathway, a key regulatory system in biology (including stem cell homeostasis) and often in pathophysiological conditions such as endometriosis. Recently emerged novel biological concepts in signal transduction and gene regulation like exosomes and microRNAs are discussed in their putative role in the pathogenesis of endometriosis. Keywords: WNT/β-catenin signaling, endometriosis, microenvironment, reproductive tract, stem cells, exosomes. 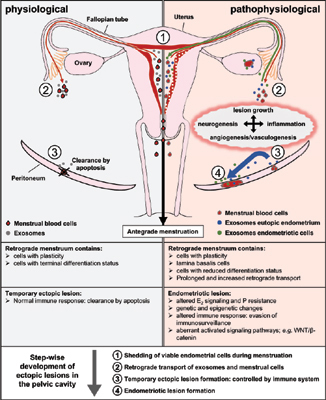 Keywords:WNT/β-catenin signaling, endometriosis, microenvironment, reproductive tract, stem cells, exosomes. Abstract:Background: A substantial body of studies supports the view that molecular and cellular features of endometriotic lesions differ from those of eutopic endometrium. Apart from that, evidence exists that the eutopic endometrium from patients with endometriosis differs from that of females without endometriosis.